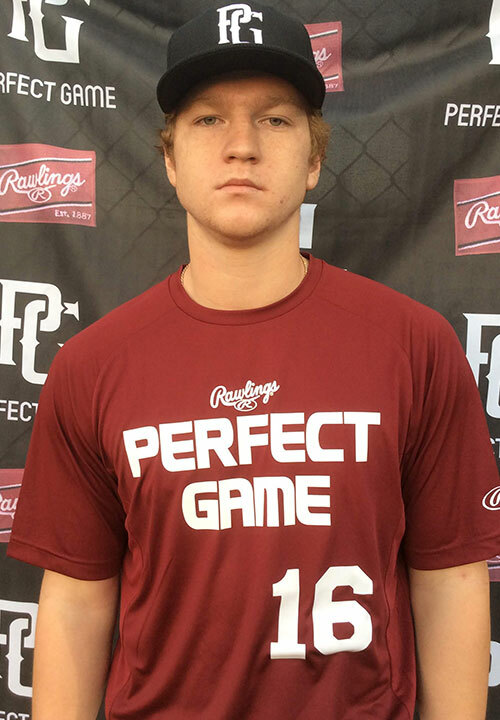 Samuel Bones is a 2019 RHP/SS, IF, 3B with a 6-2 190 lb. frame from Stockton, CA who attends Lincoln. Large, athletic fame with present strength. Primary right handed pitcher with a short side step to high leg lift delivery. Stays balanced at gather and worked to the plate with drop and drive actions. Medium arm circle at take back and released from a high three-quarters slot. Fastball jumped out of hand well producing downhill tilt with occasional run to arm side in the low to mid 80's, topped at 86 miles per hour. Curveball showed 11/5 shape with tighter spin and solid depth in the upper 60's. Flashed the ability to drop arm angle at times with breaking ball and created more sweeping action. Consistently worked to all quadrants of the zone and induced weak contact. Also worked out defensively from the infield showing deliberate footwork while ranging for and surrounding the baseball. Funnels with two hands and worked through exchange efficiently. Released from three-quarters slot showing developing accuracy across the infield at 82 miles per hour. Right handed hitter with a slightly open stance and high back elbow set. Works to contact with rotational lower half actions. Compact hand path to baseball with a linear barrel plane through extension. Flashed present bat speed and strength at contact when connecting with baseball out front. Created sharp, loud contact between the gaps when on time and squared. Good student. Named to the 2018 California Prospect Showcase, Top Prospect List.